An original letter of correspondence between brothers and business partners Sydney Octavius Chase and Joshua Coffin Chase. Topics discussed in the letter include Sydney Chase's meeting with Forrest Lake and Doctor McKenzie, the future of the Florida Citrus Exchange, and voting for William Gibbs McAdoo for the Democratic Party's presidential nominee. Chase & Company was established in 1884 by brothers Sydney Octavius Chase and Joshua Coffin Chase. The company sold insurance and later invested in storage facilities and fertilizer sales. Chase & Company was known mainly for its agricultural interests and maintained a series of citrus groves throughout Central Florida. The company was based out of Sanford and became one of the city's largest employers into the early twentieth century. 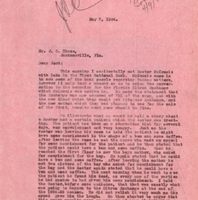 Original letter from Sydney Octavius Chase to Joshua Coffin Chase, May 7, 1924: Chase Collection (MS 14), box 7, folder 14.11, Special and Area Studies Collections, George A. Smathers Libraries, University of Florida, Gainesville, Florida. 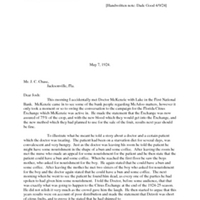 Digital reproduction of original letter from Sydney Octavius Chase to Joshua Coffin Chase, May 7, 1924. This morning I accidentally met Doctor McKenzie with Lake in the First National Bank. McKenzie came in to see some of the bank people regarding McAdoo matters, however it only took a moment or so to swing the conversation to the campaign for the Florida Citrus Exchange which McKenzie was active in. He made the statement that the Exchange was now assured of 75% of the crop, and with the new blood which they would get into the Exchange, and the new method which they had planned to use for the sale of the fruit, results next year should be fine. To illustrate what he meant he told a story about a doctor and a certain patient which the doctor was treating. The patient had been on a starvation diet for several days, was convalescent and very hungry. Just as the doctor was leaving his room he told the patient he might have some nourishment in the shape of a bun and some coffee. After leaving the room he met the nurse who made an appeal for some nourishment for the patient and he then state that the patient could have a bun and some coffee. When he reached the first floor he saw the boys mother, who asked for nourishment for the boy. He again stated that he could have a bun and some coffee. After leaving the mother he met two sisters of the boy who asked for nourishment for the boy and the doctor again stated that he could have a bun and some coffee. The next morning when he went to see the patient he found him dead, as every one of the parties he had spoken to had given him some nourishment. I told the Doctor, before some audience, that that was exactly what was going to happen to the Citrus Exchange at the end of the 1924-25 season. He did not relish it very much as the crowd gave him the laugh. He then started to argue that this years results were on account of poor distribution and made the statement that Detroit was short of citrus fruits, and to prove it he stated that he had shipped to a friend there some 25 boxes of either oranges or grapefruit which sold at a good price and resulted in his selling 150 acres of grove property. I then told him that real orange growers were not selling their property, but were trying to make a living out of it. That rather confused him. He then started to talk about there being enough population in the United States to absorb all citrus fruits produced in Florida and California and that we could not produce too much if it was property [sic] distributed. At this juncture I had a telephone call and went into the booth and when I returned to the Cashier’s Office the Doctor had gone, however just before I left his company he told me to vote for McAdoo. I told him that McAdoo had now promised to lower the rates which several years ago he raised, McKenzie’s reply was thathe could do it. The Doctor stated positively that there was going to be a house cleaning and reorganization in the Tampa office and that the Sales Department would be efficient and up to the minute, and would know exactly what they were doing. Chase, Sydney Octavius. “Letter from Sydney Octavius Chase to Joshua Coffin Chase (May 7, 1924).” RICHES of Central Florida accessed April 24, 2019, https://richesmi.cah.ucf.edu/omeka/items/show/1600.